Laminator is the starting point of the Film Magic Lab a Musashino Kikai establishment. Its history started with manufacturing of the first Japanese made extrusion laminator. 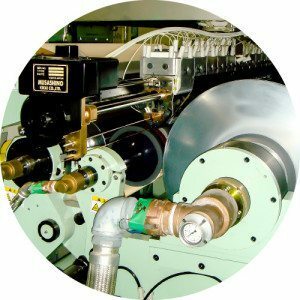 We have the experience to make large scale laminator with 4000mm of its roll width as well as a co-extrusion laminator, both of which are also the first Japanese made machines. And afterwards we have been continuing to challenge ourselves to try a lot of new technologies. We are dealing with such various fields as paper, plastic film, fiber, leather goods, wood metal, ect. Basically the extrusion is the same as film making technology idea. 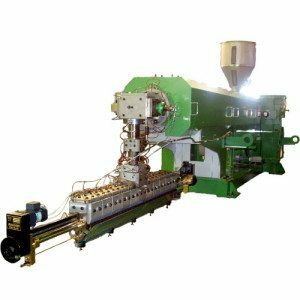 It looks simple work that the melted resin is output, but the process requires important technology: mixing the resin evenly, providing even heat stably, coating the melted resin that becomes high viscosity after melting. The process know-how we accumulated and our high technology allow to realize high quality. This is the heart of laminator. We manufacture the original head for the product customer wants. We put importance on lamination accuracy and stick to“Made in Japan”quality. Overwhelming processing technology allows to have strong trust.